Playing with the filters on a telescope can show us amazing things. In a recent case, Japanese astronomers looked at the star Gilese 1214 in blue light and watched its “super-Earth” planet (Gliese 1214 b, or GJ 1214 b) passing across the surface from the viewpoint of Earth. The result — a probable detection of water in the planet’s atmosphere. “When combined with the findings of previous observations in other colors, this new observational result implies that GJ 1214 b is likely to have a water-rich atmosphere,” stated the National Astronomical Observatory of Japan. This finding confirms work performed in 2010 (where scientists concluded the planet was mainly made of water) and adds on to information in 2012, where infrared measurements with the Hubble Space Telescope revealed a possible steamy waterworld under a thick atmosphere. The planet is an ideal candidate for exoplanet observations because it is relatively close to Earth (40 light years away) and is about 2.7 times the size of our planet, allowing for possible comparisons between the worlds. Three images showing the relationship between the atmosphere’s composition and the transmitted colors of light. Top: Hydrogen-dominated atmospheres see much of the blue light scattered, meaning that transits become more visible in blue light than red light. Middle: Atmospheres with less hydrogen scatter blue wavelengths more weakly. Bottom: Cloud-covered planets make it more difficult for light to make its way up through the atmosphere, even if the atmosphere is dominated by hydrogen. There’s still some debate over whether “super-Earths” are closer in nature to Earth or to Uranus or Neptune (each about four times Earth’s diameter), requiring scientists to scrutinize that class of exoplanets to learn more about their properties. One area under investigation is where the super-Earths form. It is believed that planets arise out of a protoplanetary disk, or cloud of gas, ice and debris that surrounds a young star at the beginning of its life. Hydrogen is a big part of this disk, as well as water ice beyond the “snow line“, or the region in a planetary system where waning heat makes it possible for ice to form. The team acknowledges it’s still possible there is hydrogen in GJ 1214 b’s atmosphere, but add their findings do corroborate with past ones suggesting water. This picture (above) shows HD95086 b, which astronomers believe is one of only about a dozen exoplanets ever imaged. It’s 300 light-years from Earth. The planet candidate is about four to five times the mass of Jupiter and orbiting a very young star that is probably only 10 million to 17 million years old. That’s a baby compared to our own solar system, estimated at 4.5 billion years old. We still have a lot to learn about this object (and the observations from the Very Large Telescope will need to be confirmed independently), but so far astronomers say they figure that planet formed in the gas and dust surrounding star HD 95086. But the planet is actually very far away from the star now, about twice the distance as the Sun-Neptune orbital span in our own solar system. “Its current location raises questions about its formation process,” stated team member Anne-Marie Lagrange, who is with the Grenoble Institute of Planetology and Astrophysics in France. “It either grew by assembling the rocks that form the solid core and then slowly accumulated gas from the environment to form the heavy atmosphere, or started forming from a gaseous clump that arose from gravitational instabilities in the disc. 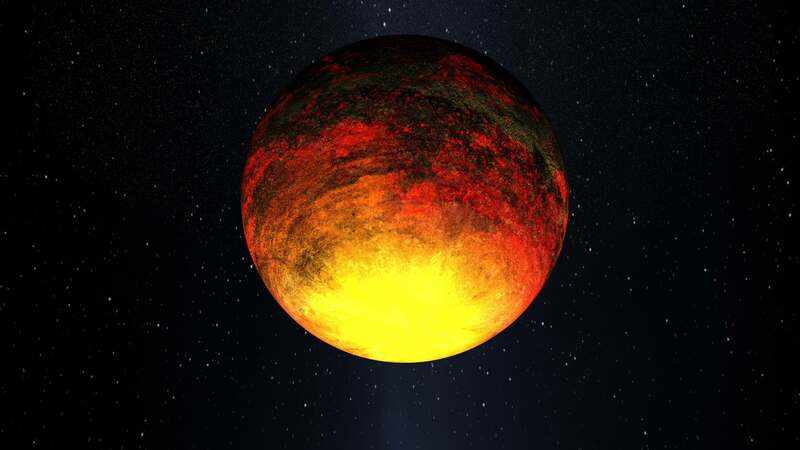 Astronomers estimate the planet candidate has a surface temperature of 1,292 degrees Fahrenheit (700 degrees Celsius), which could allow water vapor or methane to stick around in the atmosphere. It will take more VLT observations to figure this out, though. The results from this study will be published in Astrophysical Journal Letters. The paper is also available on prepublishing site Arxiv. We don’t have the budget yet to send Star Trek‘s U.S.S. Enterprise to probe the surface of strange new worlds, but luckily for humanity, astronomers are figuring out techniques to do that without even needing to leave Earth. One of Earth’s prolific planet-hunters, the Kepler Space Telescope, has found a lot of planet candidates with rocky surfaces. That’s exciting for astronomers, as rocky planets tend to be smaller than their gas giant counterparts. Also, learning more about rocky planets could give us more clues as to Earth’s history, and that of other planets in our solar system. But how the heck, from so far away, can we begin to understand the surface? One idea: Check the heat signature, or in more scientific words, look at exoplanets in the infrared part of the light spectrum. Because different kinds of rocks emit “signature” spectrums in different wavelengths, it’s possible we could pick up the signs of silicate rocks or other types of material. There’s a caveat, though. Check out more details in the scientific journal article here, or the entire Astrobiology Magazine article at this link.